In June 2015, the IwB travelled to Milan, Italy for a series of events held in conjunction with the World Expo. 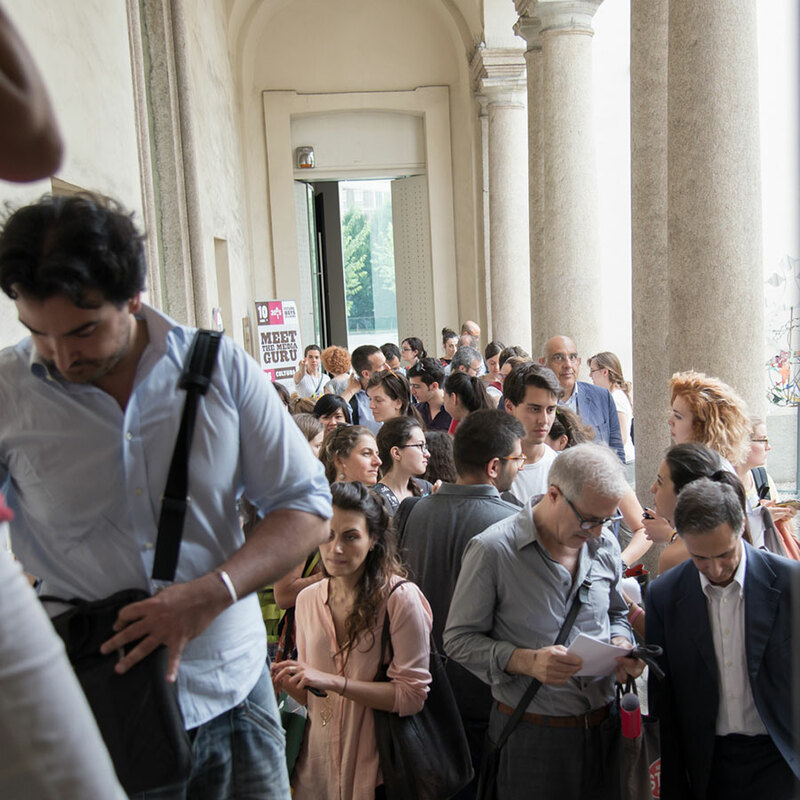 In partnership with the Milan-based Meet the Media Guru (MtMG), network focused on bringing together thought leaders in the digital media field, the IwB participated in several Expo special events and co-organized the Future Ways of Living Charrette. To create design projects that illustrate ‘future ways of living.’ Charrette teams were asked to address the ways in which we will communicate, care, move, eat, learn, work, and play in the next 10 years by examining our social system of mobility, communication, energy and economy, heath and wellness, education, and food. 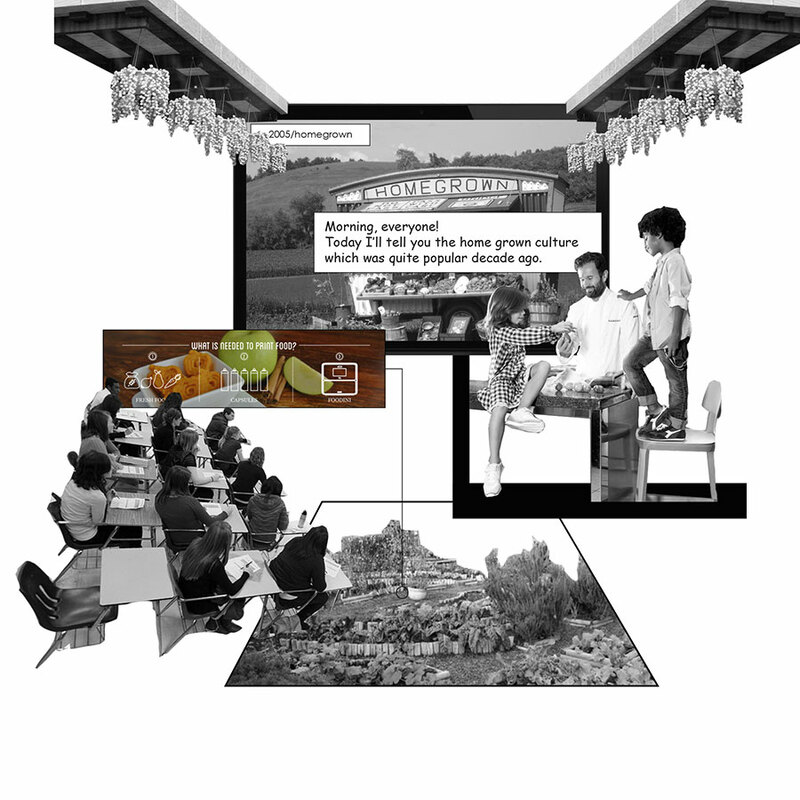 What was clear in the charrette projects was that the future ways of living we want for ourselves require us to change the artificial boundaries that we have erected over the last 100 years. In the early to mid-twentieth century, the World’s Fairs emerged as platforms for forecasting future technology trends. Scholarship also began to emerge asking about the social impact of new technology. Marshall McLuhan argued that technology’s impact would be radical and all-encompassing. Terms like “medium is the message” and “global village” have become slogans of our contemporary world. Indeed, the message of the fairs and scholars like McLuhan continue to ring true–the technologies we design for ourselves, will in return shape us. In 2015, as Milan prepared to be the host city for the World Expo, the IwB and Meet the Media Guru (MtMG) decided to create a hybrid event with the best practices of both organizations to offer a window into ‘future ways of living.’ The event was conceived of as an opportunity to continue thinking about the social impact of technology. MtMG planned a special edition lecture bringing together key guest speakers, while the IwB planned an interdisciplinary charrette bringing together students, faculty, and professionals from over 20 different countries. For the lecture series, MtMG selected 18 ‘Gurus,’ who provided inspiration for the charrette teams covering topics like hyper-reality, the future of synthetic digital spaces, ethics, and transparency in the age of big data. Following the Guru Days, the IwB and MtMG held the charrette to build on the lectures’ ideas and insights. Over 40 charrette participants were split up into six teams and asked to imagine the changes to our most vital and physical infrastructure and systems such as: food, mobility, energy, health and wellness, communication, and education. The teams’ work on the charrette challenge showed how vital the questions posed by the World’s Fairs continue to be. The role of technology in our lives is extensive. Some teams focused on locating flaws in current systems and products and proposing solutions to these problems. Other teams proposed whole new systems, forecasting the types on new technology that could emerge in the next ten years. Charrette teams were asked to forgo a formal presentation and instead present their concept as a 20-page book spread. 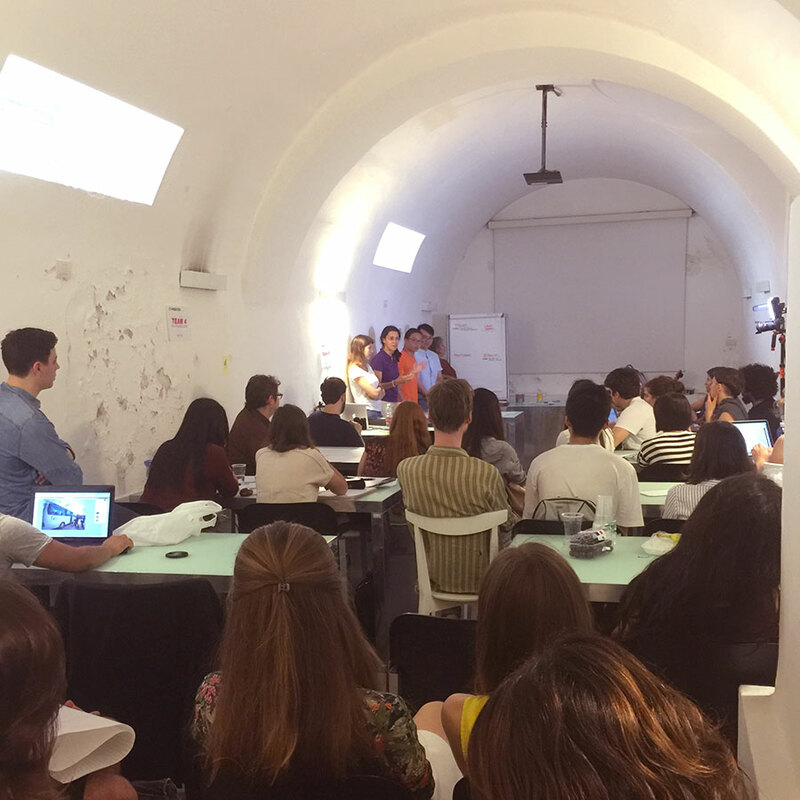 The teams’ findings will be used for a publication that will be distributed at the BookCity Milano literary fair in October 2015. In view of the success of the Future Ways of Living Charrette, the IwB and MtMG are planning a summer charrette for 2016. View summaries of the charrette design proposals below. View the Future Ways of Living Documentary Film Trailer here. Stay tuned for details on the release of the Future Ways of Living book! Food – How will we cook? The Food team was given the task of forecasting how we will cook in the the next 10 years. The team proposed solutions to improve people’s experience with food and make them more aware of issues related to food production, waste, distribution, storage, processing, and consumption. The proposal showed six placed-based scenarios for food in the year 2025, demonstrating how food systems could work in the future kitchen, restaurant, supermarket, school, public space, and airport. Looking at these sites, the team defined a common efficiency system that aims to: keep consumers up to date on the bigger system; assist consumers to maintain a healthy and sustainable lifestyle, thereby gradually contributing to consumers becoming more conscious of their food choices; and enhance the eating experience in terms of efficiency, quality, collaboration, and transparency through technology and analogue features. The focus of the team was to highlight the flaws in the current food system and attempt to continuously nudge the consumer and the big players to make better food choices. Stay tuned for our publication to find out more about this project! Mobility – How will we get around? The Mobility team was given the task of forecasting how we will get around in the the next 10 years. The team proposed “Synchronicity,” a seamless, smart mobility system that caters to the global citizen. Synchronicity has two key functions. It allows users to seamlessly move between modes of transportation along their journey, automating payment and customizing the user experience. It also has a centralized operating system that compiles data from users, mobility modes, and mobility infrastructure to create a more efficient and smart system, which adapts to flows and user needs. The Synchronicity system has several components including, a user device, environmental transponders or sensors, and the meta operating system. Stay tuned for our publication to find out more about Synchronicity! Energy – How will we work? The Energy team was given the task of forecasting how we will work in the the next 10 years. The team proposed “Creative Synergies: Supporting a Creative Economy,” a digital system that allows individuals to come together to form a cooperatively owned creative consortium. The proposal focuses on supporting the autonomous worker by leveraging collaboration and increasing creative energy to allow for a more effective working environment. The Creative Synergy platform manages projects and connects various workers, based on their disciplines and interests, allowing them to work together in an efficient and collaborative way. This means that autonomous workers can use the system in different levels in their projects, from research to execution, interacting with real time feedback and data in all phases of the process. Stay tuned for our publication to find out more about Creative Synergies! Health & Wellness – How will we care? The Health and Wellness team was given the task of forecasting how we will care in the next 10 years. The team proposed “Cloud Health,” an integrated health care system that connects the existing public health care services and programs and the private production of health products and wellness, with a new peer-to-peer assurance model that rewards participants who maintain a healthy lifestyle. Cloud Health has a life-long and worldwide opt-in service that influences wellness, provides education for prevention, and coordinates care in a holistic manner for body, mind and spirit. Cloud Health can collect, analyze and push information on food nutrition management, it can set reminders on activity levels, give tips on balancing mental health, manage any chronic or new illness, and suggest lifestyle adjustments and improvements for the individual. Stay tuned for our publication to find out more about Cloud Health! Communication – How will we connect? The Communication team was given the task of forecasting how we will connect in the next 10 years. The team proposed “Platformer,” a universal networking platform that supports the creative industries by linking creators, clients, suppliers, objects and technologies at multiple scales to generate new ideas, employment, revenue, and access to resources. Platformer adjusts to the work landscape of the 21st Century. It emphasize the role of the creative industries and innovation in future labour. As work is increasingly mechanized and governments, universities, and the private sector continue to support entrepreneurship and incubators across Europe and North America, Platformer provides collaboration across cultural and national boundaries. Stay tuned for our publication to find out more about Platformer! Education – How will we learn? The Education team was given the task of forecasting how we will learn in the next 10 years. The team proposed “Keep Learning,” a system that builds connections between play and learning, and learning and working, through a digital platform that keeps track of your learning achievements and goals. Keep Learning revolutionizes the educational system into a modular, customizable, and global experience. A user is able to arrange a personalized learning schedule based on a 12 month semester calendar. Building your own learning program is facilitated via physical and digital coaches or avatars, who guide the process when needed. The proposal aims to accelerate personal development and increase social interconnectivity. By using globalized digital tools and fostering global assemblies of interest with those tools, Keep Learning can re-organize the current learning systems to better perform. Stay tuned for our publication to find out more about Keep Learning!